Above bove the Assur appears the date, in ancient Hebrew letters taken from the coinage of the First Rebellion (65-70 CE); "Shin Samech Gimel" standing for "Shanah Samech Gimel" (63rd Year). As we have no custom of dating our coinage by foreign calenders, nor even from Creation, we took the example of our predecessors and dated our ceremonial coin from the Liberation of the Land of Israel. This year's coin, minted to be given on Purim of 2011, will open the 63rd Year celebrations of the State of Israel. Below the Assur appear the words "Lo Heilech Chuki" (Not Legal Tender), to satisfy the needs of the Bank of Israel Law that we are not producing a currency substitute. 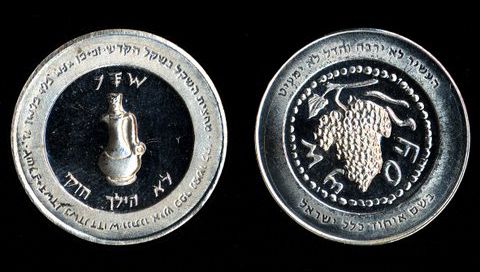 A zuz, or quarter shekel from the Second Revolt - the Bar Kochba Rebellion, featuring a grape cluster with the inscription "Shimon (Bar Kochba)."